"Mutations in these genes can be responsible for skin diseases and conditions such as melanoma and albinism," says Michael Shapiro, associate professor of biology and senior author of the study published online Feb. 6 in the journal Current Biology. "In humans, mutations of these genes often are considered 'bad' because they can cause albinism or make cells more susceptible to UV (ultraviolet sunlight) damage and melanoma because the protective pigment is absent or low," says Eric Domyan, a biology postdoctoral fellow and first author of the study. "In pigeons, mutations of these same genes cause different feather colors, and to pigeon hobbyists that is a very good thing." Pigeon breeders have drawn on their centuries-long experience to produce about 350 distinct pigeon breeds, focusing particularly on beak shape, plumage color and feather ornaments on the head, feet, beaks and elsewhere. But until this study, the specific mutations that control color in rock pigeons (Columba livia) were unknown. "Across all pigeon breeds, mutations in three major genes explain a huge amount of color variation," Shapiro says. Various forms of a gene named Tyrp1 make pigeons either blue-black (the grayish color of common city pigeons), red or brown. Mutations of a second gene, named Sox10, makes pigeons red no matter what the first gene does. 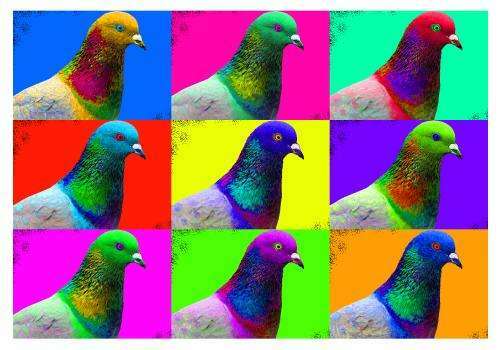 And different forms of a third gene, named Slc45a2, make the pigeons' colors either intense or washed out. The scientists discovered how pigeons' feather color is determined by different versions of these three genes – known as variants or alleles – and by what are called "epistatic" interactions, in which one gene obscures the effects of other genes. "Our work provides new insights about how mutations in these genes affect their functions and how the genes work together," Shapiro says. "Many traits in animals, including susceptibility to diseases such as cancer, are controlled by more than one gene. To understand how these genes work together to produce a trait, we often have to move beyond studies of humans. It's difficult to study interactions among the genes in people." "Both Tyrp1 and Sox10 are potential targets for treatment of melanoma," he adds. "Mutations in Slc45a2 in humans can lead to changes in skin color, including albinism (lack of skin color)." Different versions of the three major pigeon-color genes affect the relative proportions of major forms of the melanin pigment − eumelanin and pheomelanin − and their distribution within cells. Eumelanin provides black and brown pigmentation, while pheomelanin provides red and yellow pigmentation of feathers. Interplay among the three major genes is complex, resulting in diverse coloration of pigeons. "Mutations in one gene determine whether mutations in a second gene have an effect on an organism," Domyan says. In other words, one gene can mask the effects of another in relation to pigeon color. The three pigment genes don't control how the colors are distributed in patterns on pigeons' bodies, such as white patches of feathers on some breeds. The genetics of color patterns remains to be determined. The scientists showed that feather colors in 82 breeds of pigeons could be explained by various combinations of the three genes and their different versions. "Color is one of the most important traits to breeders − it makes a pretty pigeon," Shapiro says. Tinkering by breeders led to great color diversity in pigeons across the centuries, providing scientists with perfect specimens to study pigmentation genetics. Shapiro and co-workers found that versions of the Tyrp1 gene were responsible for determining three basic pigeon colors: blue-black, ash-red, and brown. Blue-black color of pigeons is considered "normal," because neither Tyrp1 nor the other two major color genes contain mutations in these pigeons. City pigeons typically are this color. Even before the rise of genetics, "Darwin realized that blue-black was the ancestral pigeon color, and that the various domestic rock pigeon breeds represented a single species," Shapiro says. When Darwin crossed pigeons of different colors, blue-black pigeons consistently appeared among the progeny. The Tyrp1 gene produces a protein that helps make the pigment eumelanin. Pigeons with blue-black feathers have normal Tyrp1. Ash-red and brown birds pigeons contain different mutations in the Tyrp1 gene, which leads to less or different pigmentation. Mutations that affect the Sox10 gene override colors determined by various versions of the Tyrp1 gene. 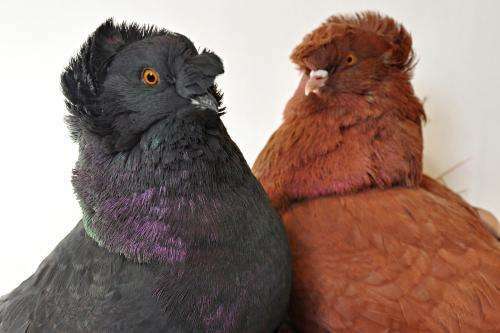 Regardless of whether the Tyrp1 version makes pigeons blue-black, ash-red or brown, mutations that regulate the Sox10 gene result in red pigeons. Mutation of the Slc45a2 gene decreases the intensity of colors determined by Tyrp1, Sox10 and their mutants. Depending on the version of the Tyrp1 gene – blue-black, ash-red, and brown − pigeons harboring the mutant Slc45a2 gene still display the same colors, but in watered-down or diluted versions, less intense than those with normal Slc45a2. For example, a pigeon with both the ash-red version of Tyrp1 and the mutant Slc45a2 gene has ash-yellow feathers. Pigeons with Sox10 and Slc45a2 mutations are yellow, which is the dilute form of red. Most of the pigeon blood and feather samples used in the study were collected at pigeon shows in Utah, where breeders from across the country flocked to display their pigeons. After extracting and sequencing DNA from the samples, the researchers compared DNA sequences among the pigeons and observed that specific versions of genes associated with specific feather colors.